Mouse bait comes in handy to control the mice problem in home, basement, garage and farms. They are the best alternatives to the conventional glue stick mouse traps which are very inhumane and uncomfortable in disposing of the trapped mouse. Using the best mouse baits available in the market rats and mice can be eliminated without any frustration that you would have experienced with conventional traps. There are many mouse baits available in the market, but choosing the best bait for mouse trap to kill rats effectively is the hardest part. We have gone through an extensive list of mice baits and narrowed done based on various parameters to give you the best mouse baits traps ever. Below are the list of 10 mouse trap baits those chosen as the best mouse baits to kill rats and mice based on various parameters such effectiveness, protection period, safety and value for money. This mouse bait is made up of brodifacoum that kills warfarin resistant rats/mice. 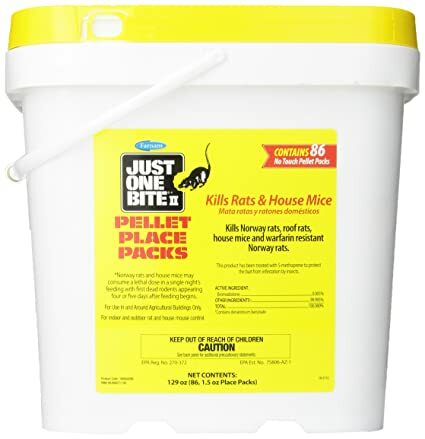 This is one of the best bait for mouse trap and mouse killer, rodents eaten this bait dies from internal hemorrhages in 3 to 6 days after the first feeding. D-Con Mouse bait is very useful for the farmers to get rid of mouse and rodents from the agriculture land. Mixing with a small amount of peanut butter makes this mouse bait more effective. When the conventional rat traps are not able to kill rats and mice then you have Dcon mouse bait to kill rats and mouse. Dcon Mouse bait acts a best rat poison and good companion for the farmers who suffer from the rodents especially during the harvests. This mouse bait product is made up of human food-grade ingredients and enhancers (mixed with the active ingredients bromadiolone) for a bait so palatable so that the rats and mice cannot control themselves to eat. ​As the name says, Tomcat All weather mouse bait works in all weather even at rainy season. Tomcat mouse bait works effectively on rats and mice in barns, attic and other unused places. You need to remember dogs smell very well during the bait placement and your cats can squeeze their head anywhere it fits. So ensure that you don't want to bait the mice and rodents that are easily accessible to your pet dog or cat. One single bite is a lethal dosage for Norway rats and house mice. The first dead rodents appearing from 4-5 days after the first feeding. Farnam mouse bait is the best mouse bait for indoor and outdoor rat and house mouse control. This Farnam mouse bait has to be used only in and around agricultural buildings only. One Another important thing makes this as the best bait for mouse trap is the killing of toughest warfarin resistant Norway rats in 4 days after the first consumption. Place pack fits in burrows, runways and hard to reach areas where mice activites are seen very high wait for four to five days to see the fewer mice activites. Please be noted that this mouse bait is extremely toxic to mammals and birds, dogs, cats and pet animals. Do not place this mouse poison when there are pets and children. This mouse trap bait contains active ingredients of brodifacoum and bitrex that kill resistant house mice and Norway rats effectively. Rats and mice those consumed this one feeding lethal does die within five days after the first feeding. It contains second generation anticoagulant to kill rats and mice effectively than another mouse trap baits​. 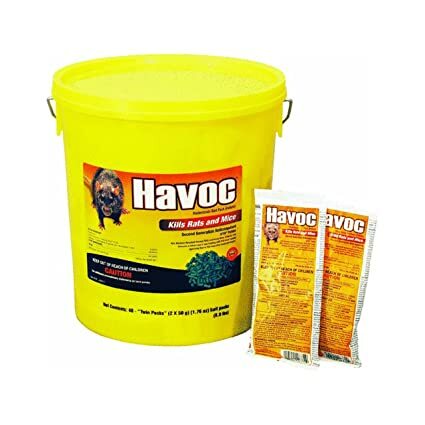 HAVOC Mouse bait to be used in agricultural buildings and around farms only. This is one of the best mouse bait food for mouse trap which is specially formulated with peanut butter flavor that attracts mice and rats to eat this mouse trap bait without neophobic (Fearing for anything new). Contrac mouse bait is firstly All-weather Blox Rodenticide and a single feeding Rat and Mouse bait. Contrac uses the idea blend of food grade ingredients and low wax to produce a highly palatable, weatherable mouse trap bait that is very attractive to rodents. Secondary poisoning is very minimal with Contrac and an antidote to the poison (vitamin K1) is readily available.It has enough bait blocks to kill hundreds of rats and mice. Each mice trap bait block has a hole in it to anchor into a bait station. The Contrac moue bait works well in wet and dry conditions. Rats, Mice and Rodents can consume a lethal dose in just one feeding. CONTRAC mouse trap bait is also less toxic to non-target animals, in both primary and secondary poisoning situations, than other single-feeding anticoagulants. For ease of use this mice trap bait, a hole in the center of the BLOX lets technicians place it on bait securing rods in tamper-resistant bait stations, or nail or wire the BLOX in place. Ramik Rat and mouse bait is an All weather bait kills rats and mice indoors and outdoors. This mouse Bait combines food processing technology and patented procedures to create an unusually palatable and highly attractive rodenticide. This mice trap bait is Fish flavored and high protein appeal to attract rodents,rats and mice even in the most difficult weather conditions. It Contains 45 pieces of 43 gm mini bait packs which is good enough to kill large number of rats and mice. This is the best mouse bait for control of commensal mice and rats indoor and outdoor. Kata put mouse and rat bait is a reduced-risk rodenticide that kills Norway rats, Roof rats, house mice, and voles. This mice trap bait is formulated with warfarin - a highly effective anticoagulant with very low environmental and secondary toxicity making it a very good bait for rats and mouse traps. Because warfarin is effective for rat control at low concentrations, it is one of the active ingredients in rodenticides. However, in cases of accidental ingestion by children or pets, Vitamin K1 is a readily available antidote.Kaput Rat & Mouse Bait is packaged in two ounce place packs. Rodents readily accept the bait as a food source because it mimics the grains and seeds that they naturally consume. This is one of the best mice trap bait that can be placed as a whole, unopened package. The specialised design of the packaging material allows the rats, mice and rodents to smell the bait and gnaw through the pack to access it. protecta sidekick tamper proof bait stations comes with 1 Key in each box. The Special Feature of this mouse bait is that it Works as both a bait station and a monitoring station. The vertical bait secures the rods, locks when closed, opens to the side for fast, convenient servicing, rounded interior corners make cleaning the station easier than ever. The built-in card slot holds the Protecta service card, ideal for fitting into tight baiting locations. This mouse baiting station comes in black color and impact-resistant, injection-molded plastic material is tamper resistant and locks when closed, but be sure that the mouse bait should always be kept out of reach of children and pets. This mouse bait station is built with low profile compact design to fit under pallets and furniture. It Works inside or outside your home to get rid of rats. The Sturdy plastic material helps us to clean the dead rats and mice easily. The Horizontal bar secures bait blocks and the 2 locking mechanisms keep the box locked at all times and require you to have key to open and expose the poison inside. One key included in each box.Effective with small and large rodents such as mice and rats. Before placing the mouse baits, Need to ensure Dogs, cats and other pets are away from these baits as their odour can cause aversion to these mouse baits. Also, There is a chance that these baits can be licked or tasted by the pets. Should be wrapped and disposed of and should not be thrown outside without wrapping it. As this dead mouse may be eaten by other animals could also get affected. All the above mouse baits can be used to kill mouse,rats and rodents in home, garage and farm without any additional equipment and Also, these baits can be used as best bait for mouse traps to lure the mouse to the rats and mouse into the trap using their food grade ingredients and strong smell.